You have come to the right place if you are looking for fun, engaging and exciting Letter B activities to do with toddlers, preschoolers and kindergartners. Our activities are widely used by teachers, moms, dads, child care providers etc. for learning and teaching while being fun for the kids! Make bead necklaces. Sort buttons. Cut out the bird body. Trace circles (head), wings and beaks, one for each child. The children cut out the traced patterns. Use blue construction paper for the body and head, yellow for the beaks, and white or light blue for the wings. Have the children draw in the eyes and color in the wing if they want. Write their name on the wing and hang them around the room. Use brown paint, paper plates, pompon balls, markers, crayons, tissue paper, lunch bag puppets, whatever you like. On white constriction paper, trace large circles for the children to cut out. Than with a black marker make a small circle in the middle and divided the ball into six sections. Than paint the sections in bright colors — yellow, blue, red — leaving a section between each color. Ask parents to send some baby and new mother magazines and catalogs in. Invite the children to look through the magazines and catalogs and cut out pictures of baby items – high chairs, baby food, cribs, baby toys, bottles, diapers, playpens, and so on. Discuss how each baby item is used and then help the children glue the pictures to a large sheet of construction paper. Finger-paint Balloons: Glue five lids (baby food lids) open ends up, in a semicircle on a piece of heavy cardboard and fill each cap with a different color of tempera paint. Have each child in turn dip all five fingers of one hand into the paint in the lids and then press them on a sheet of white construction paper to make prints. When the paint has dried, let the children draw lines down from their fingerprints, turning them into balloons with strings. Pour three or four different colors of tempera paint into separate aluminum pie tins. Partially blow up a small balloon that matches each paint color. Then have the children dip the balloons into the matching colored paints and press them on sheets of white construction paper to create balloon prints. The letter B could be the wings of a bee. For a big bee attach the letter B to a big blown up balloon. Be sure to discard the pieces when the balloon pops. With two empty toilet paper rolls per child, glue the rolls together to form binoculars. Punch holes at one end on the outside of the rolls and tie a string from one to the other so binoculars may hang around neck. Decorate with stickers, markers, or paints. Wear on walking field trips! 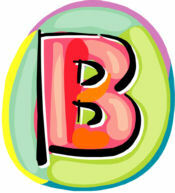 Have each child make a large letter B with glue on paper – glue the beans in the letter shape. Cut large triangles from blue, brown or black construction paper. Have the children use paint, glitter, scraps and other materials to make a big B on the banner – have children cut out pictures from magazines of items that begin with the letter B – glue them to the side of the banner. Make a large birthday cake from construction paper. Have each child draw, color and cut out a candle from construction paper. Write their names and birth dates on the candle and glue to the cake. Mix birdseed and peanut butter together. Have the children use popsicle sticks or tongue depressors to scrape the mixture onto wide spaced cones. You could also string together pieces of bread, orange slices, cranberries and popcorn. Send home a list with the children of foods that birds will eat – have them bring one of these items in – then make the bird feeders from whatever foods they bring in. hang the food outside for the birds. If possible hang the feeders from a tree that can be seen from a window so the children can watch the birds eating. Give the children small dabs of red, yellow and blue or orange and black finger paint – have them mix them with their fingers – makes brown – have the children write B’s in the paint. Help the children cut out a simple bee hive from brown paper – and make a small bee. Fold white construction. paper in half – cut out a butterfly shape. drop small amounts of tempera on one wing – fold and press together. Give each child a potato for a body of a bug. Provide toothpicks, pins with colored heads, pipe cleaners, buttons, and colored paper to complete the bug. Have the children give the bugs names beginning with the sound of B. Give each child bright blue tempera or finger paint and have them paint a cut out shape of a bunny. Have each child tell something about their painting. Write out what the children say in their own words, then have them find and draw balloons around letter. Have children paint a paper plate yellow. Let dry. Then paint on black stripes, if desired. Cut out rectangles with a circle on top for the antennae. Glue that to the plate. Afterwards just add eyes (either draw them or use the googly eyes) and a smile. You will need: throwaway cups, Equal amounts of liquid dish soap and water, blue food coloring or blue paint, Straw (cut small slit in it to prevent sucking up into the mouth but allowing bubbles to come out the bottom). Mix up bubble solution in each cup. Add blue food coloring. Blow bubbles into cup until almost overflowing. Take white paper and lay in the bubbles. When they pop on the paper, it leaves pretty blue circles. Provide opportunities for children to string beads. Start by having them string the beads in any order – then try to have them follow a pattern. Cut out a letter “B” shape. The children cover it with fingerprints and use markers or finger paints to decorate the fingerprints as bugs. Cut circles of various sizes from brown construction paper. Help the children arrange the circles on sheets of paper to make little bears. Suggest that they make a blue bow tie and glue on two buttons for eyes. Get pictures of birds, butterflies, bees, bears, bunnies…Read and talk about how they are alike and how they are different. What is big? What is small? Ask a beekeeper to come to your school/home. We had one who brought everything he used. It was fascinating for us to see all their equipment and the bees, their honey, etc. Talk about queen bees, drone bees, worker bees. Play “the Flight of the Bumblebee” and teach the children to do the tail wagging dance that bees do when they return to their beehive. Balance bean bags on your head while walking on a balance. Collect and clean bones from the kitchen: chicken, turkey, beef, pork, lamb. Sort them and talk about where each came from and what animal. Pretend you are a bag piper, baby, bike, bear, bat, bee, bed, bird, butterfly, bunny, bubble, bean, baseball player, ballerina, etc. Do a comparison on the different kinds of beans. Have a bean buffet! ( make different bean dishes) Make a graph asking: Which beans do you like best? Green beans, Lima beans, Baked Beans, Refried Beans,etc. Ask the Orkin man or another pest control company representative to come to your school/home and give a lecture on bugs. They usually have samples and may even have coloring books! Do a study on birds and have a guest bring birds to your class or go to a zoo or a bird center. Have someone come in to demonstrate basket weaving. Introduce each letter by pulling out a Letter Bag (gallon size Ziploc bag containing things that begin with that letter). The B Bag could contain: buttons, belt, beans, brads, a beet, beads, a bottle of bubbles, a banana (plastic one wouldn’t have to be replaced), a stuffed bear, miniature ball, bag, bandana, barrette, bell, bone, bottle, basket, badge, book, balloon, etc. Encourage each child to bring a baby picture of himself or herself to school. Display the pictures on a bulletin board. Invite the children to guess who the babies are. Put in one of your own. Make a balloon lotto game by dividing a piece of heavy white paper into six sections and drawing a different colored balloon in each square. Cut matching colored squares out of construction paper. To play the game, have the children take turns placing the construction paper squares on top of the matching colored balloons. Partially blow up ten small balloons. Place them in a dish pan full of water. Set the pan on the floor and let the children take turns fishing for balloon fish with a food strainer. Help each child count his or her catch before putting the fish back in the pan. Give each child a balloon. Have the children practice blowing them up. Help each child tie his or her balloon and play “Balloon Keep It Up”. See how long the children can keep their balloons up in the air without letting them touch the ground. To make the game, draw or trace a picture of a clown holding a bunch of balloons on 8 X 12 poster board. Draw the balloons by tracing around a plastic milk cap. You’ll need to save caps in several colors. With markers, color the clown and each balloon to match your collection of milk caps. To make the board longer lasting, use Contact paper. Play a type of tic-tac-toe game where they toss the beanbags onto a board and try to have them land on certain targets. You could also put letters on the floor, have the children toss a bean bag, and have them name the letter that it lands on. More advanced children might think of a word that starts with the letter. Challenge the children to try walking with a book or beanbag balanced on their heads. Then ask the children to stand with one foot lifted up off the ground. Then have them close their eyes. Discuss what happens! Tape a long strip of wide tape down the middle of a hallway floor. Challenge the children to walk along the tape line. See who can walk the farthest without stepping off the tape. Give each child one sectioned half of an egg carton and a large handful of dried beans. Post a number between one and ten (depending on the maturity of the children). Ask the children to count that many beans into each section of their egg cartons. Try a backward day. What can you wear backwards? You can wear a hat, shirt, or pants backward. What else can be worn backwards? Can shoes be worn backwards? What are some reasons we don’t spend our lives walking backwards? What would life be like if we had to walk backward? Make a bus out of your chairs (put them all in a big box the kids paint is even more fun) and go on an imaginary trip and see all sorts of B things out the window. Will your local bus company bring a bus for the kids to see inside or can you take a bus ride if you have public transportation available? Use any ball and 2 Liter soda bottles with a little sand in the bottom. Great fun indoors or out. A show and tell day could center around everyone’s favorite book. Depends on the age for safety! Fill them with a couple scoops of confetti and then blow them up. Have the kids jump on them and pop them. Set up a bank in dramatic play area. Make sure you have a briefcase and deposit slips, etc. A local bank or parent might make a donation. Our local bank has a special program for kids. They might do a field trip. Help the children make a list of beautiful items, such as a rainbow, a ring, or a sunset. Ask each child to draw a picture of the item that he or she thinks is the most beautiful. Send a note home asking all the children to bring something for “show and tell” that begins with the letter B. This works best if the kids can bring something on any day of the week because inevitably, some of the kids and/or parents forget. When the children share this item that they bring, ask them to put it beside, below or beneath a box. Use the opportunity to discuss babies. The kids can bathe them and give them a bottle and a binky. Make some. Those new bread makers aren’t quite the same as the good old’ days of kneading and punching, but they are fun to use. Also, a field trip to the bakery will thrill the kids too! Try different shaped “blowers” to get different effects. See who can blow the biggest bubble. Bring in all kinds — borrow some from the fire department, a fisherman, a hunter, a soldier or sailor, a construction worker… can you match the boots to their job? Dance to loud Barney music or watch a Barney video, as long as your sanity holds out. Get bells and a drum to bang. Go get some kazoos at the dollar store and have a marching band. Add other instruments and walk around the block a few times. If you have them, share them. If not, I bet some of the kids do. Encourage the children to make up stories and plays involving their beanie babies. Have the children stand in a circle. Throw the ball to a child who has to say something that begins with B. That child then throws to another, etc. Continue until no more words can be thought of. Take a survey – find out how many children like bananas – graph the results. Then make several different banana dishes for the children to sample – such as Banana Nut Spread (mix mashed bananas with peanut butter – spread on crackers), banana pudding, banana berry mix (slice bananas, add other fresh berries, top with yogurt and brown sugar). Let the children cut their own bananas with a plastic knife. Make Banana Bread using your favorite recipe. 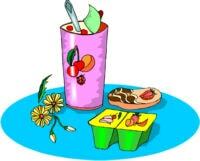 Very easy – pour whipping cream and a touch of salt into baby food jars – shake until butter forms! Point out that beans are a vegetable. Make bean salad (mix green, wax and kidney beans top with Italian dressing mixed with a little sugar). Bananas and bagels or biscuits for breakfast. Have lunch on a blanket. Give each child a slice of bread. Have the children first put “bedspreads” on their “beds” using peanut butter, cream cheese or butter. Then have them put “bugs” on the beds using small edibles such as raisins, nuts, cereal bits, small pieces of fruit or vegetables. Set up supplies to let each kid make their own banana pudding with layered bananas/vanilla wafers/vanilla pudding. (Root beer float with chocolate ice cream) Explain how this drink got its name – “brown” is for the color of root beer and “cow” is for the milk in the ice cream. Teach the children to sing “Rock-a-Bye Baby” and invite them to share other lullabies they know. Have children stand in 2 rows, facing each other, link hands and raise to form a long bridge. One child at a time goes under the bridge, and the bridge “collapses” on the words “We all fall down”, catching whichever child is under the bridge. Wow this is great! So many ideas, thank you so much for sharing.